Balsillie School of International Affairs - Fairfield Media Co. 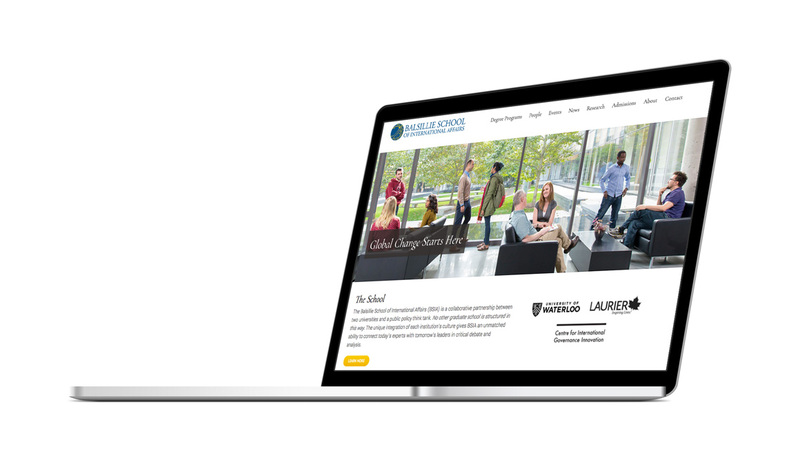 The Balsillie School of International Affairs wanted to redesign their website, lower their bounce rate (a ‘bounce’ is when a website visitor only visits one page of a website and doesn’t view additional pages) and make a better organized experience for their visitors. In collaboration with Vibrant Content, Scott Towne worked as the User Experience (UX) Design consultant on the project. Scott started by working with the key stakeholders to identify the goals of the website and the goals of the website visitors. Next, he reviewed over six years of website usage data with consideration with how they aligned with the aforementioned goals. Scott used this data as evidence for the restructuring of the websites information architecture, navigation menu construction and homepage layout with the goal of creating usability improvements for the website visitors. The user experience improvements were implemented in the excellent design and development work completed by Vibrant Content. The site launched in October of 2017 and in February 2018 the bounce rate has been lowered and the information architecture changes have provided an increase in traffic to the areas where visitors can take action steps towards becoming students at the school.